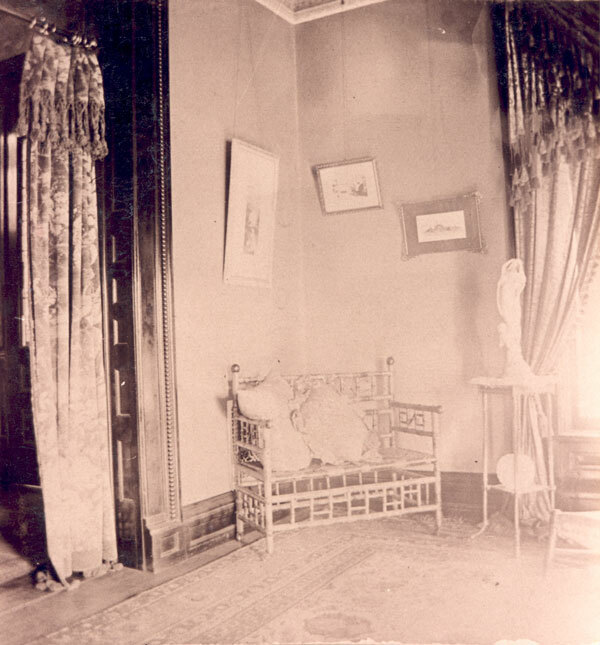 Description: Parlor in the Pratt/Campbell residence, located at 1313 North Emporia. It was built in 1887, by W. O. Sternberg for George L. Pratt, owner of Pratt Lumber Company. 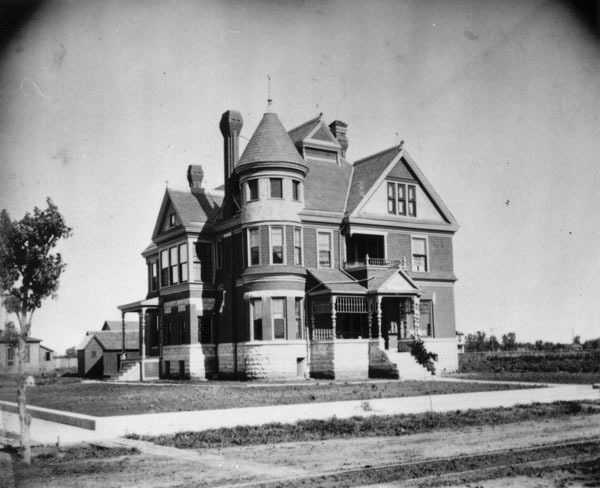 In 1899, M. C. Campbell purchased the home. Campbell was a developer of the Kansas livestock industry. 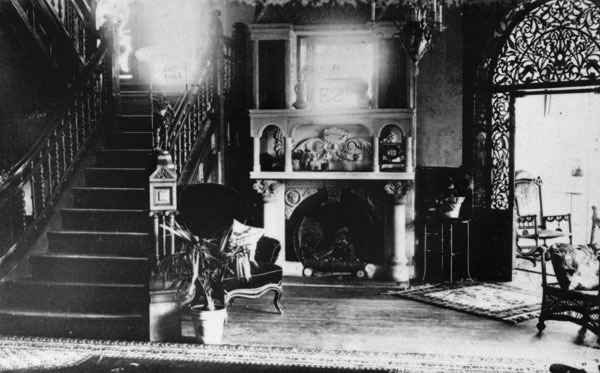 Description: Staircase and parlor in the Pratt/Campbell residence, located at 1313 North Emporia. It was built in 1887, by W. O. Sternberg for George L. Pratt, owner of Pratt Lumber Company. 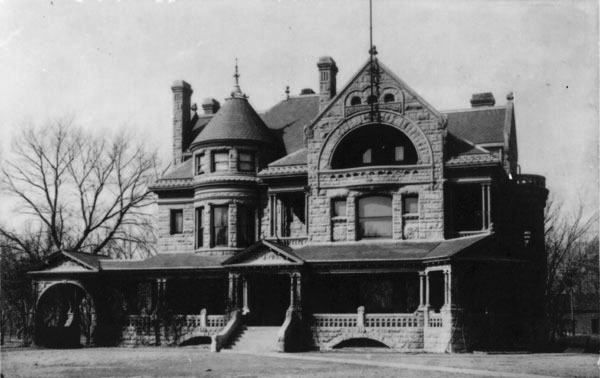 In 1899, M. C. Campbell purchased the home. Campbell was a developer of the Kansas livestock industry. 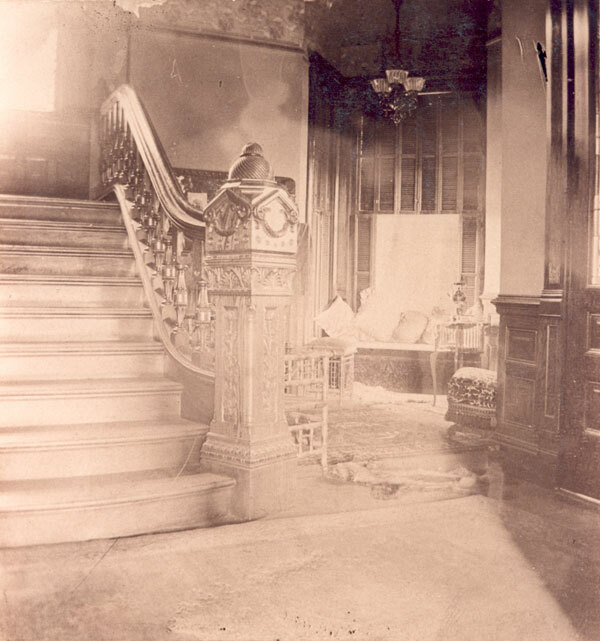 Description: Staircase in the Pratt/Campbell residence, located at 1313 North Emporia. It was built in 1887, by W. O. Sternberg for George L. Pratt, owner of Pratt Lumber Company. In 1899, M. C. Campbell purchased the home. Campbell was a developer of the Kansas livestock industry. Description: View of J. H. Aley home at 1505 Fairview. Three-story Queen Anne style house. Street is not paved; note street car tracks. Keywords: People, architecture, landscape, Wichita. 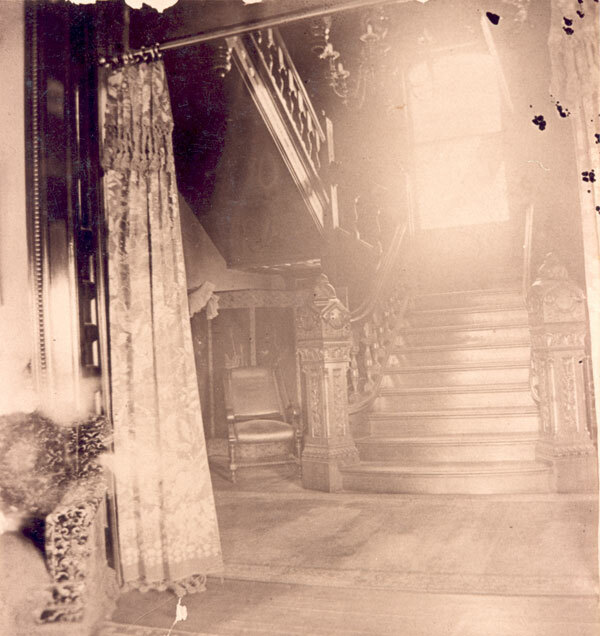 Description: Interior of Campbell home at Eleventh and Beal (now North River Boulevard). View in reception room (2) looking from fireplace toward staircase. Portraits of Mr. and Mrs. Campbell hang on the walls. Keywords: Residences, homes, houses, Victorian, furniture, domestic scenes, Riverside, Wichita. Description: Home built in 1889 by B. H. Campbell. According to 1896 city directory, original address was “corner of Eleventh and Beal” (now North River Boulevard). Looking west across Little Arkansas River. The home has been known as “Campbell Castle” and “Crumm Castle.” The building is listed on National Register of Historic Places. Keywords: Residences, houses, architecture, Riverside, Richardsonian Romanesque, parks, Wichita. 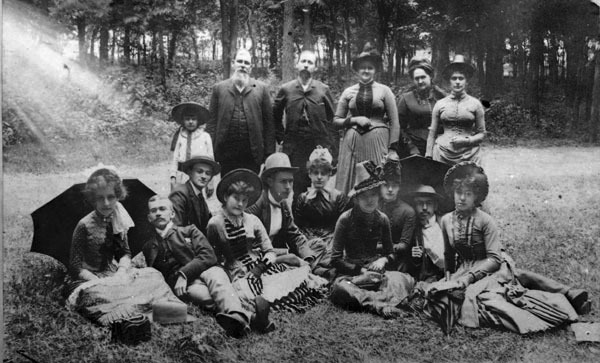 Description: Group of men and women gathered on a lawn or park setting (three are identified, on file). Keywords: People, organizations, clubs, and groups, fashion, Wichita. 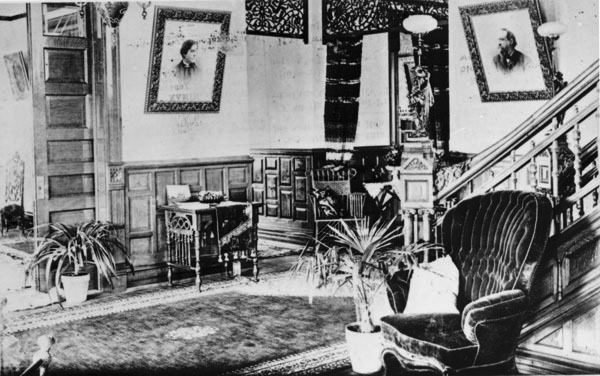 Description: Interior of Campbell home at Eleventh and Beal (now North River Boulevard). 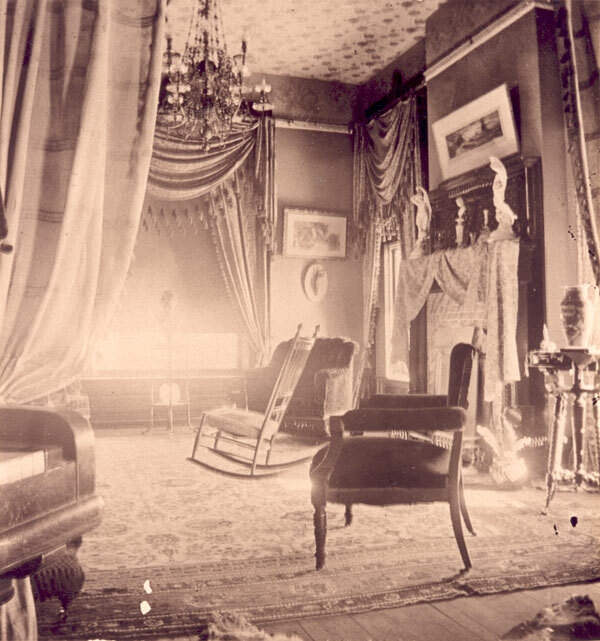 View into reception room (1) and parlor beyond. Keywords: Residences, Riverside, houses, homes, Victorian, furniture, domestic scenes, Wichita. 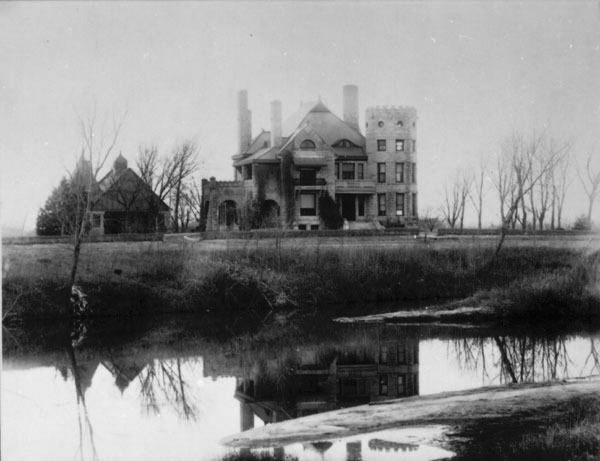 Description: Residence identified as the second home of Robert Lawrence at 415 South Seneca Street. Example of Victorian Romanesque architecture. The structure and grounds were purchased in 1896 by the Grand Chapter Order of Eastern Star and Grand Lodge A.F. & A.M for use as the Kansas Masonic Home for aging members and orphans. The building was destroyed by fire in 1916 and replaced by the current compound on the same location at the intersection of Maple and Seneca Streets. Keywords: People; organizations, clubs and groups; Wichita.